Planet editor supports editing accretion disk parameters. This is impossible. 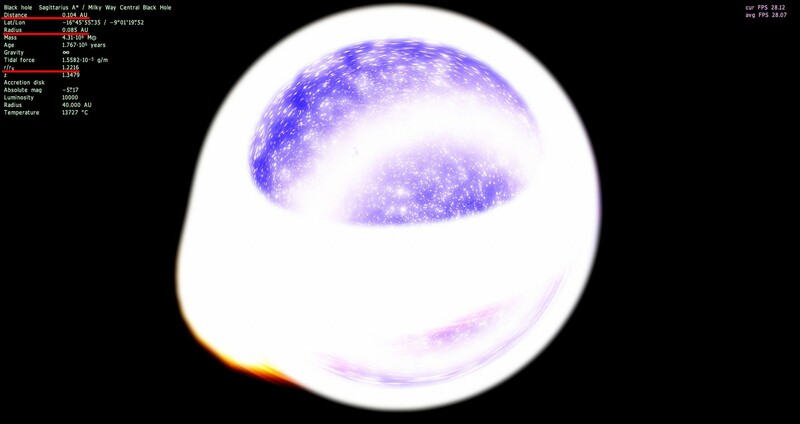 Accretion disk and warp effect is a single shader effect. Such things cannot be cascaded over each other. You can't go inside black hole. Camera is stopped at a Schwarzschild radius. Press "configure filter" button on the Star Browser dialog. * A Local Solar Time, for any world. Basically, a time of day clock, unique to the orbital parameters, size, etc. * A top-down global map. For navigating close to the surface, it would be awesome to see where I'm going, with respect to the terrain. A scalable, zoomable, orientable map, in color. This would help without having to go into high orbit, just to point myself towards that particular mountain range, crater, ocean, etc. * Another type of orientation, that follows the curvature of the world. For camera mode. Flying along at whatever altitude, this would conform to the curvature, so one doesn't have to correct the pitch every second. It would be similar to the 'Rotate with object' , without having to correct the pitch. Once the angle of attack is set, the alt should remain the same, even during complete circumnavigation. These little things seem simple enough. They would improve the simulator in the minor ways. That's still outside of the event horizon. Stationary observer near the black hole may see Universe as a disk above his head. 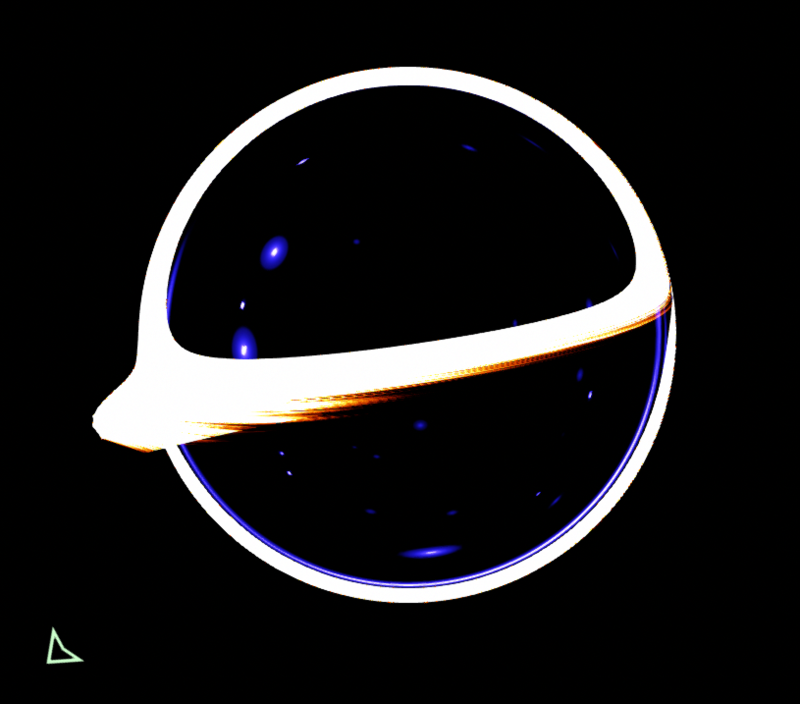 As observer approaches the event horizon, the disks's diameter become smaller than 180° (or, the same, black hole's shadow diameter become greater than 180°). At the event horizon the Universe image collapsing into a point with infinite blueshift. It's time to open a thread "Why black holes looked like this", similar to the thread about read giants. Universe is not always intuitive! This may be ambiguous. On a tidally locked planet, time of day have no sense. A planet with 90° axial tilt (like Uranus) once in a year facing the sun by by it's pole - local time have no sense in this moment. A planet with long rotational period and eccentric orbit may have moments in time when sun moved backward in the sky, sitting at the east or rising at the west (like on Mercury). I approve heartily, a topic that's fascinating beyond measure, and right now black hole sims in SE are graphically capable to help grasping the concept of black hole "shadow". That's Astronomy, baby! Yes, this may have to apply to the worlds that have rotation, orbit-to-rotation ratio, and the applicable tilt. Much in the same way as atmospheric pressure, for those that have an atmosphere. I don't see any discrepancy with a tidal-locked world, since the time wouldn't vary, but be proportional to lat/long. By the way, Vladimir, I imagined such a program as this, about 20 years ago. I played with Celestia for a bit. But, I felt that modern computers could at least allow a seamless transition from atmosphere to space, to another star, to atmosphere in the way you have done. But, you went much further than my expectation with procedural generation. It's actually incredibly awesome, what you have created. Since custom hues and saturations of atmospheres are now available as of RC 1, would it be possible to add a randomization parameter, that one could use for custom catalog planets? As far as I can tell, leaving out the Hue and Saturation parameters make SE default to Hue 0 and Saturation 1. Perhaps a "RandomizeColor true"? Granted the pseudo-random color would only change when the seed changes, and so forth. As far as I can tell, leaving out the Hue and Saturation parameters make SE default to Hue 0 and Saturation 1. Perhaps a "RandomizeColor true"? Granted the pseudo-random color would only change when the seed changes, and so forth. SE indeed keeps 0 and 1 for catalog planets, to not break down Earth and Solar System planets. Why not set up some value manually for your custom planet? Defauting to 0 and 1 is good to begin with. I figured an optional randomization parameter might be beneficial for the creative aspects of sci fi world building. Not to mention, if one used custom compositions for atmosperes, it would tell SE to try to automatically determine the best hue/saturation levels if one already specified a specific atmosphere model. jacobaaronberube, you are not inside the black hole, despite what it might look like. This is a counter-intuitive effect of relativity when you are hovering close to a black hole's event horizon. Read about it in the discussion starting here. I have a idea What about dwarf galaxies?